The Raymond M. Alf Museum of Paleontology recognized Dr. Thomas J. DeVries with the Alf Award for Excellence in Paleontological Research and Education at the annual Peccary Society dinner, held on October 21, 2017. The award honors a paleontologist who demonstrates exceptional achievement both in original scientific research, as well as in education and outreach at the primary and secondary school (K-12) levels. Dr. DeVries is a retired high school instructor who served a 22 year career at Vashon Island High School in Washington. 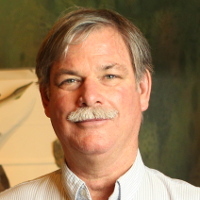 In addition to his classroom service teaching earth science, paleontology, and other topics, Dr. DeVries is a noted expert in fossil mollusks and marine geology. He conducts fieldwork with a focus in Peru, contributing to major projects addressing marine upwelling, mollusk evolution, and the deep history of El Niño. DeVries is also an Adjunct Research Associate at the Burke Museum of Natural History and Culture, University of Washington. “Being an active researcher-teacher buys instant credibility. Whether by means of a casual aside or an organized classroom activity, an active researcher-teacher can open doors for students to the ‘real world’ of science and scientists – and draw those scientists bodily into the classroom,” said DeVries. The award consists of an honorarium, an award plaque, and all travel costs for the recipient to attend the Alf Museum’s Peccary Dinner to receive the award.